I put up my nativity set today, and it seemed distinctly Brokeish to me. Of course, there were the shepherds. Behind the holy family was a donkey (damn mules) and a camel (so hungry he could eat one). There was a baby (Jenny), a madonna (Alma or Ma Twist) and some wise men...not sure who they might be. And the angel had a broken wing. It made me want to watch the movie again! So, on my way into work this morning I had to put air in my tires. I know how to do that, I have a good guage, I've done it before. But, LOL, anytime I have to do this now after BBM I have a vague worry in the back of my mind that my tires may unexpectedly blow-up and kill me. LOL, feels mildly ridiculous to see tires as so menacing. I saw a TV news report on this once. It actually does happen! However, I think it's more when you're working on a tire in a garage. I'm sure it's pretty rare for people just adding air at the gas station. Not to add to the stress of a gas-station visit, but you're probably more at risk of causing an explosion from a static electricity spark while filling the tank. Heh. I used to worry about that happening long before I'd ever heard of BBM. 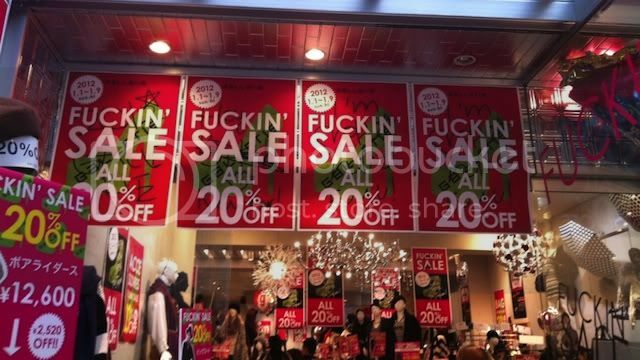 In a Japanese department store. Friend, remember when we had that slow leak in Crazy Woman Canyon? The dropped G is an especially good touch. Maybe James Schamus, Larry McMurtry and Ang Lee? Good one. But then Annie Proulx and Diana Ossana should share the Virgin Mary role. Every time I see it, it gives me a warm and fuzzy feeling. I connect it so strongly with BBM and everything that came with it, it's even a little bit of a letdown if another movies follows it.